Arepas are delicious corn cakes that are cooked on a griddle. They are very popular in Colombia and Venezuela. Arepas are prepared with a special precooked corn flour called masarepa. Arepas de choclo are made with fresh corn in addition to the masarepa, which gives them a sweeter flavor. Queso fresco cheese (similar to farmer's cheese) adds a salty contrast. 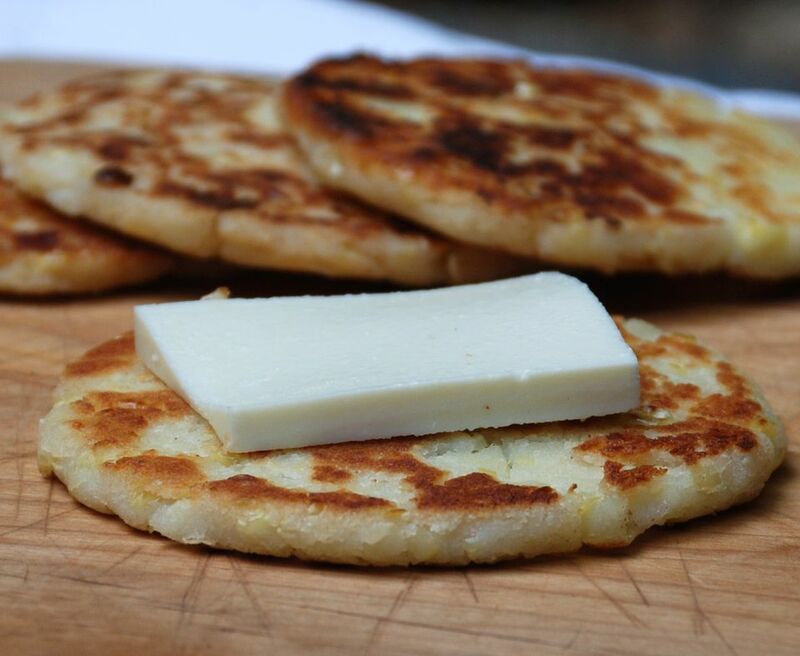 These arepas make a wonderful breakfast served with butter or some cheese. For a more hearty breakfast, serve them with a fried egg and a side of chorizo. Place the milk and the corn kernels in a blender, and pulse briefly until the corn is coarsely ground. Pour the corn/milk mixture into a saucepan, and add the butter. Heat over medium heat until milk just comes to a boil. Remove from heat, and let cool for 2 minutes. Add the masarepa to a large heat-resistant bowl. Whisk in the crumbled cheese. Slowly pour the hot milk mixture into the masarepa, stirring with a wooden spoon. Continue to stir mixture until it's cool enough to handle then knead gently with your hands until you have a smooth homogeneous dough. Season with salt to taste, and knead. Shape the arepas by taking about 1/4 cup of the dough and forming it into a ball. Flatten between your palms into a pancake shape, smoothing cracked edges with your fingers. Flatten pancake until it's about 1/3 inch thick and about 4 inches in diameter. Repeat with remaining dough. Melt a tablespoon of butter in a large skillet over medium-low heat. Cook the arepas in batches until golden brown and crispy on both sides - about 4 minutes per side. Top the arepas with a thin slice of farmers cheese while still hot, or place a slice of cheese between two arepas. Serve warm.